The Coolest Theatre Show of the Year is Back! “54 Silhouettes” Comes to Abuja. Abuja get ready!!! This December the FCT will be thrilled with one of the most creative, and without a doubt the coolest, theatre performances of the year, in Nigeria. Following a mesmerizing premiere performance in Jos, Plateau state, A.R.T will be bringing the double award winning play to the stage in the nation’s capital. The official poster for Abuja’s performance is a brand new, and absolutely smashing, poster art. If the performance in Jos is anything to go by, the Abuja edition of 54 Silhouettes promises to be an absolute blast. Receiving rave reviews from the attending audience for its originality and the passionate performances by the ensemble, A.R.T has in its stables a unique tale of today’s Africa told by today’s Africans. There are lots to come before the performance: dazzling new, promotional, photos, photos from the performance in Jos, audience reviews and a creative writing challenge in which you can win N5000. So strap yourself in and join us for some of the best fun you’ll have for the rest of the year! 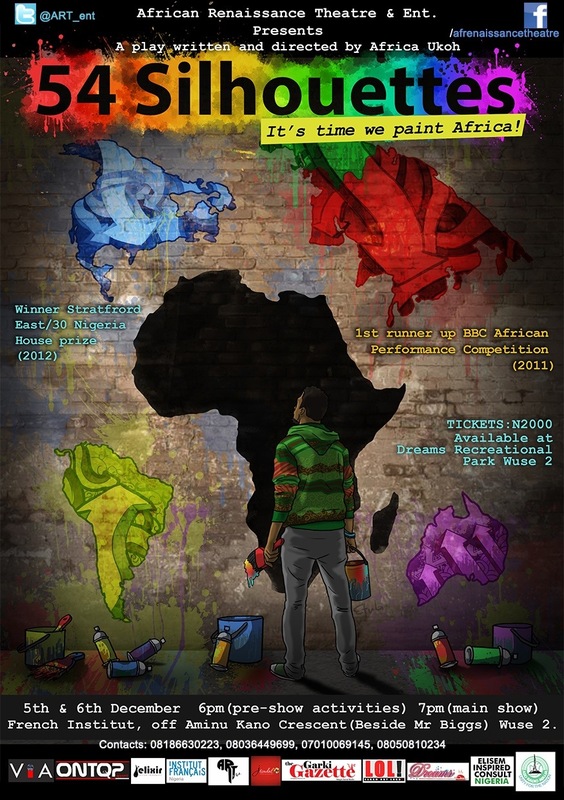 54 Silhouettes won the 1st runner up position in the 2011 BBC African Performance competition and was awarded the prestigious Stratford East/30 Nigeria House Prize in 2012. Download the BBC World Service radio version of 54 Silhouettes here. This entry was posted in Acting, Arts, Arts and craft, Drama, Performance arts, The Movement, Theatre and tagged 54 Silhouettes, Abuja, acting, africa, art, Nigeria, performance, show, theatre by africanrenaissancetheatre. Bookmark the permalink. When do we you guyz in Lagos. Right now, no present plans due to logistic reasons, but we’re hoping to get the necessary support. Thank you for asking, Ndu.